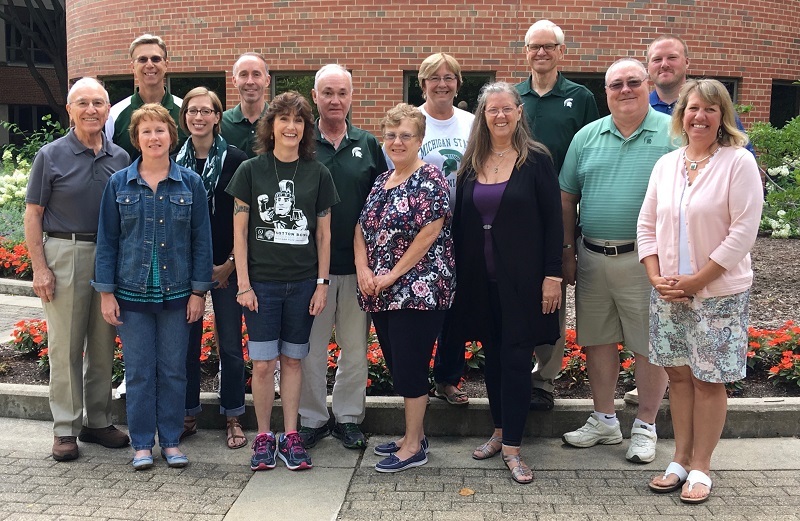 The 2017-2018 MSU Alumni Band Board of Directors, pictured from left to right: Front row – Stacie Detgen, Melissa Mackey, Betty Elliott, Lynn Brown, Bob Rice, Susan Gould. Back row – Dale Bartlett, Jim Barry, Abby Zarimba, Tim Fox, Greg Pell, Nancy Nelson, Jack Nelson, Matt DuPrey. Missing: Mike Scholes. Change of Home or Email address? To keep you informed, please let us know when you move or have a change of email address by calling (517) 351-4582, mailing a note to MSU Alumni Band, c/o Tim Fox, 1850 Snyder, East Lansing, MI 48823, or emailing alumband@msu.edu. Note: The MSU Alumni Band Updates are sent out using the email address alumband@msu.edu. To be sure you receive the updates, please make sure that your email system is not blocking this address as spam.